Betnovate (Betamethasone) helps to reduce the redness, itching, and swelling of skin conditions such as eczema, psoriasis, contact dermatitis, and seborrhea. Betnovate helps to reduce the redness, itching, and swelling of skin conditions such as eczema, psoriasis, contact dermatitis, and seborrhea. Use Betnovate as directed by your doctor. This medication is usually applied 2 or 3 times daily or according to the instruction. Enough medication should be applied to completely cover the affected area with a thin film. The medication should be gently and thoroughly massaged into the affected area. In certain conditions, the doctor will order the application to be covered with a dressing. Ask your health care provider any questions you may have about how to use Betnovate. 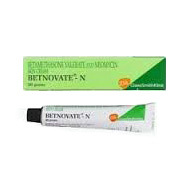 Betnovate is a corticosteroid that is used for the topical treatment of skin irritations. If you miss a dose, take it as soon as possible and continue with your regular schedule. If it is almost time for your next dose, skip the missed dose and continue with your regular dosing schedule. Do not take a double dose to make up for a missed one. Store Betnovate at room temperature, between 68 and 77 degrees F (20 and 25 degrees C). Store away from heat, moisture, and light. Keep Betnovate out of the reach of children and away from pets.